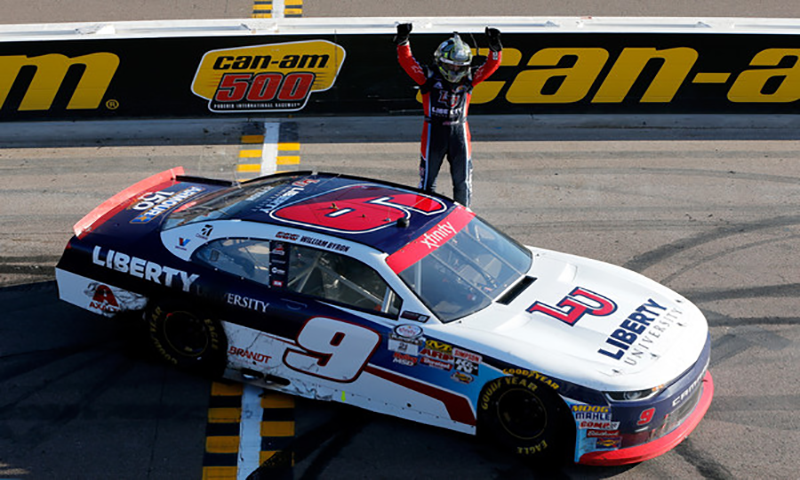 AVONDALE, Ariz– After a suffering a heartbreak of losing out on a title chance one year ago, William Byron gets his shot to at redemption and a chance to win his first NASCAR series title as he wins the Ticket Galaxy 200 at Phoenix International Raceway. The young JR Motorsports driver inherited the lead late after a Brendan Gaughan blew a right front tire and caused a caution 20 laps to go. The team gambled on a two tire strategy and it paid off as Byron celebrates his fourth victory of the season. The day was tough for not only the No.9 team but all the JRM as they were without their normal pit crew members. A plane carrying the normal crew members was forced to land in Arkansas for repairs. JRM called upon a mixture of Hendrick Motorsports development crew members already at the track to service all four cars Saturday afternoon. The race started with Erik Jones leading the field to the green flag and taking an early lead. A fast charging Blaney made quick work of the Joe Gibbs Racing driver for the top spot. On lap 22, Brennan Poole and the lapped car of Caesar Barcarella made contact entering turn one. The contact sent the playoff driver into the outside wall and ending any chance for Poole to advance to Homestead.